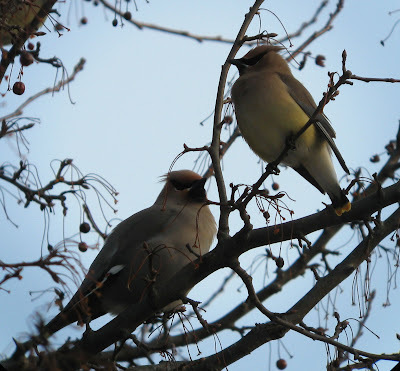 Bohemian and Cedar Waxwings - Unity Park, Turner's Falls, Franklin Co., MA. 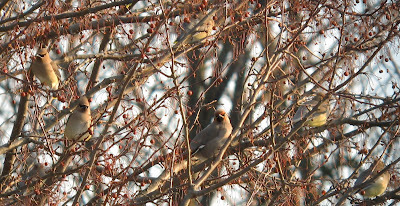 Bohemian Waxwings provided a pleasant diversion from the gulls at Turner's Falls on a mild, spring-like afternoon. 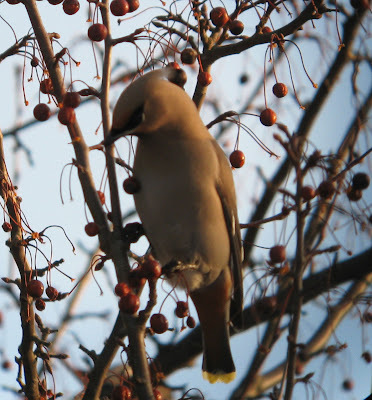 They were feeding with a group of about 60 Cedar Waxwings and some American Robins on fruiting trees in Unity Park. 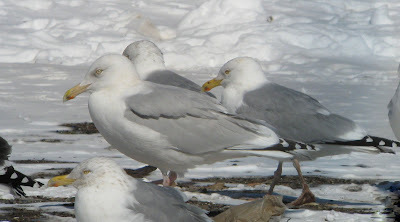 I'm not sure of the numbers, but I saw three and heard more calling from across the road in a private yard, probably about half-a-dozen in all. 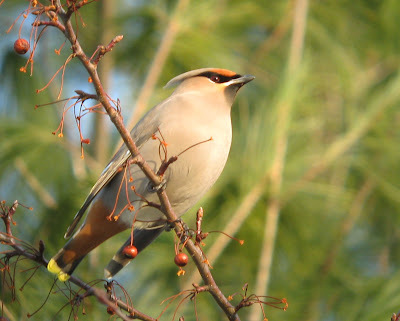 Reports of Bohemian Waxwings have been quite frequent in Western MA over the last couple of weeks and it was rather rewarding to finally catch up with a few. 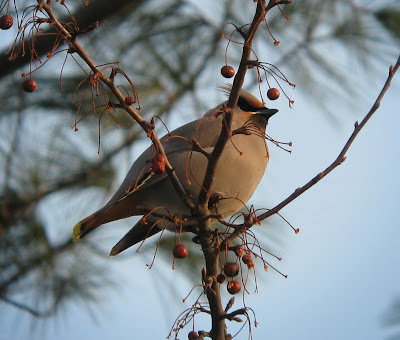 I also heard Bohemian Waxwings flying over Riverview Drive in Gill, presumably birds from this Turner's Falls group. 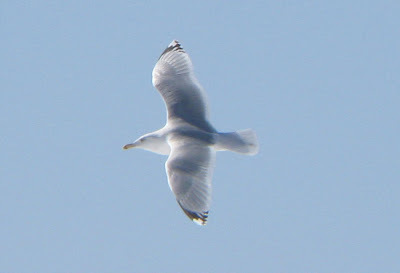 As for the gulls, it was pretty much a typical evening with a six species and no major rarities; 3 Kumlien's Gulls (all first-cycle), 1 Glaucous Gull (first cycle) and 1 Lesser Black-backed Gull (adult). 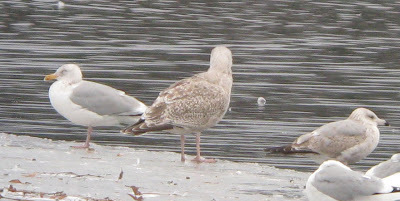 Nelson's Gull (Glaucous x American Herring hybrid) - Windsor/Bloomfield Landfill, Hartord County. March 4th, 2009. Still present after a week affording better views and images. 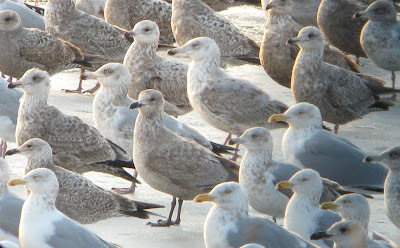 Larger than most American Herring Gulls with paler gray upperparts, dark slate gray (rather than black) primaries, and pale-lemon staring eye. 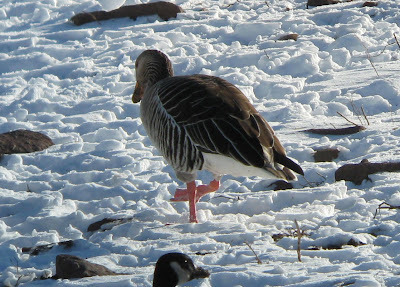 Graylag Goose - origin uncertain, Whirlwind Hill Road, East Wallingford, CT. Found and reported by Greg Hanisek on Feb 22nd. 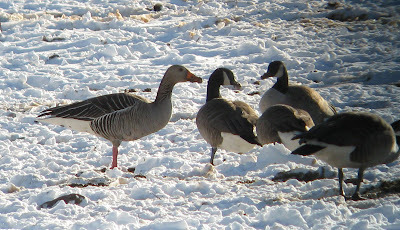 After spending four not so productive hours at Windsor Landfill, I decided to head further south after a timely call from Nick Bonomo who'd just seen the Graylag Goose at MacKenzie Reservoir, Wallingford. Reaching the site took longer than I'd hoped with traffic problems on I-91 and the bird was no longer present on the reservoir when I arrived. 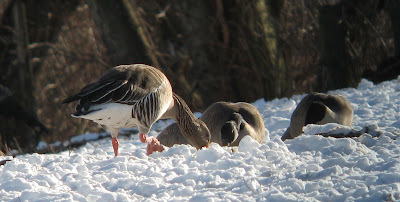 However, I soon located it feeding with Canada Geese on Whirlwind Hill road and enjoyed good views at comfortable range. 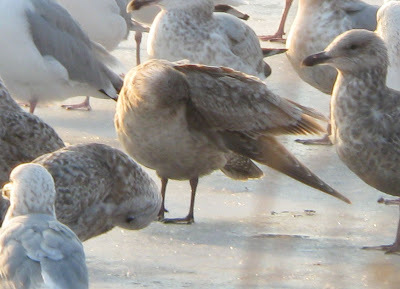 This bird is pristine plumage, hind toes intact and shows no signs of any form of captivity. 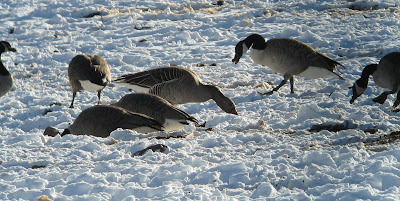 It was quite skittish on the ground, calling frequently and tending to hide amongst its companions for most of the observation. 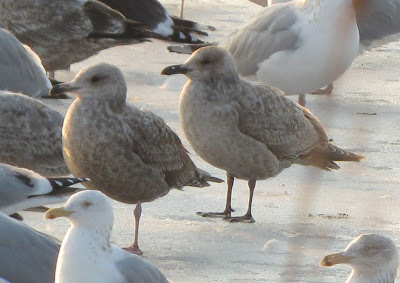 The bird is gathering interest after Greg Hanisek's initial find on Feb 22nd, and has received an upbeat appraisal from the ABA's news page (PEEPS). 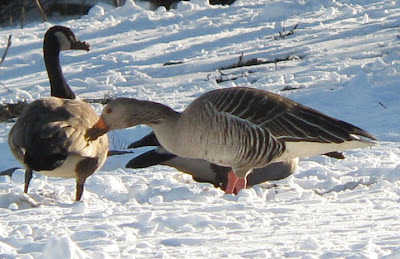 Graylag Goose was added to the ABA list in 2008 after a spring migrant spent some days on a drill ship some 200kms off St.John's in Newfoundland. 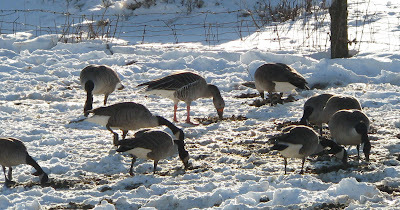 Observations of Graylags with wild Canada Geese are bound gather interest in the future, especially in the New England states. 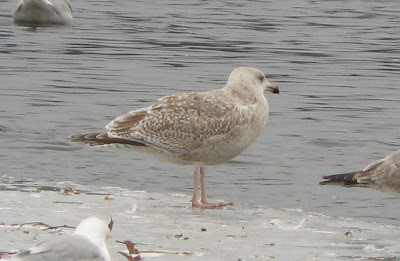 The bird is a nice orange-billed example of the nominate form anser which breeds in Europe, including Iceland which has seen a huge population increase in recent years. 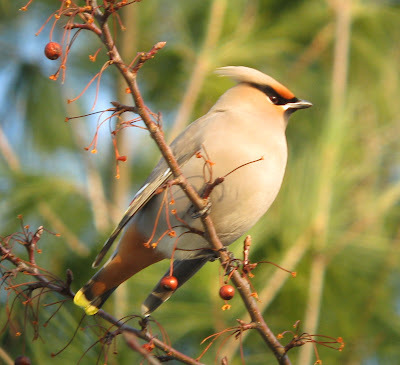 I'm grateful to Nick Bonomo for the heads-up, and kudos to Greg Hanisek for the having the presence of mind to put the bird into the public forum! This may well be the last batch of images that I can feature on this interesting bird. 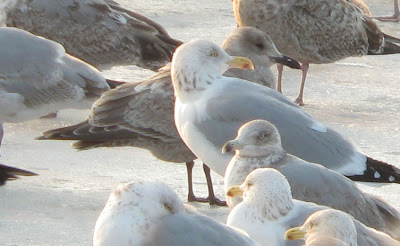 It has more than a passing resemblance to a first-cycle Thayer's but I and several other observers have found the overall size (about the same as average American Herring Gull) and the rather ragged look to the scapulars a little off putting. Also, there's been a constant question mark over the pattern of the outer primaries on the spread wing which have always appeared less strikingly 'two-toned' than most first-cycle Thayer's that I've seen. 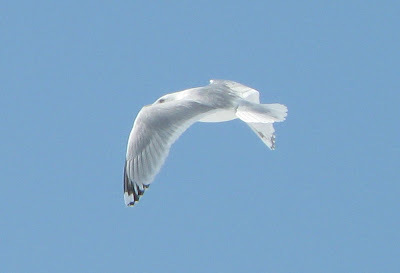 Unfortunately, I don't have any shots that show the spread wings well. 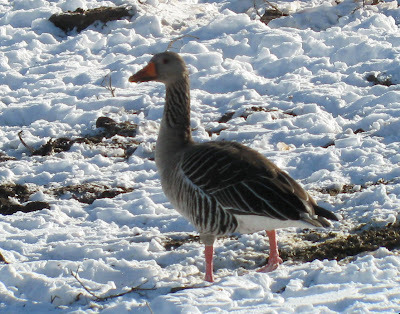 This bird may well elude identification and appears to have moved on. 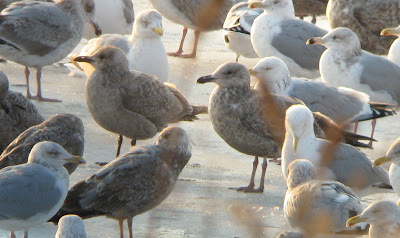 It wasn't in the gull roost this evening (03/02/09) and may have been last recorded by Tom Pirro on Feb 27th which also happened to be the last evening that the Slaty-backed Gull was recorded! Here's a link to Tom's blog entry. 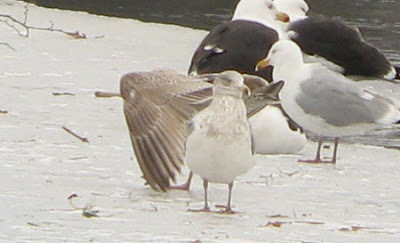 presumed Great Black-backed x Glaucous Gull hybrid - first-cycle. Barton Cove, Gill, Franklin Co., MA. March 1st, 2009. 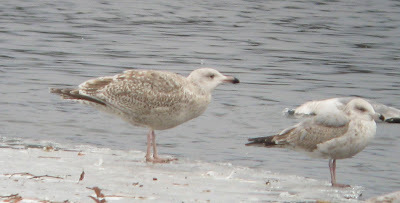 This interesting first-cycle gull, glossed over by me for some time as a Nelson's, was identified by Jeremiah Trimble and Marshall Iliff as a hybrid between Great Black-backed and Glaucous Gulls on Feb 28th. 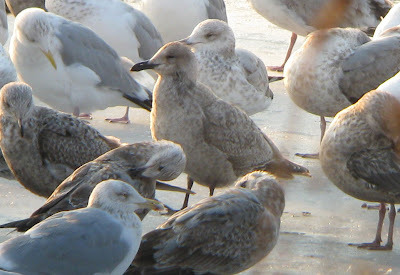 The bird itself has been present in the Barton Cove roost for well over a month, possibly even longer than that. 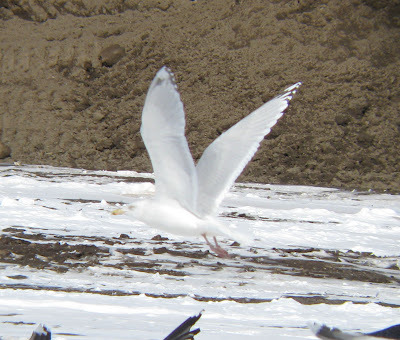 I'll be checking my photos for the first documentation that I have of this bird. 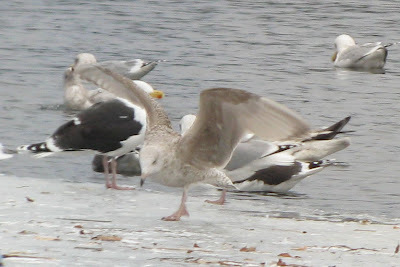 The bird has an overall frosty cast with mid-brown primaries quite broadly fringed with pale edges. With wings raised or in flight, there's a hint of a Thayer's like pattern with dark outer webs and pale inner webs creating the 'two-toned effect', plus this bird shows quite a neat dark trailing edge to the primaries. 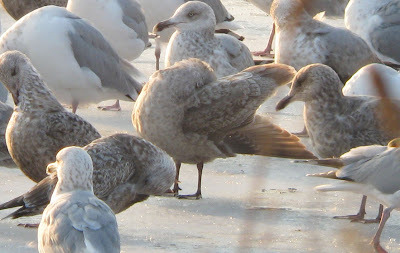 I must confess, I'd always been a little put off by the pale brown but rather broad tail band to consider anything other than American Herring Gull as one of the parents. 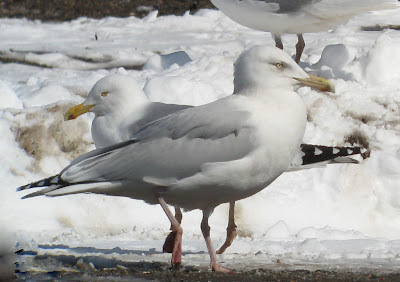 However, it's a really nice bird, possibly the first documented record of this hybrid combination in Massachusetts. Here's a link to Marshall's comments on Massbird.